If you experience bulging leg veins, aching and pain in the legs, heaviness, tiredness of the legs, itching and burning along bulging veins, restless legs or leg swelling, you may have symptomatic varicose veins that warrant evaluation and treatment. Varicose veins can become enlarged and in some cases quite prominent. They can be seen in some individuals as serpiginous (snakelike), raised lumps in the thighs, legs, calves and ankles. 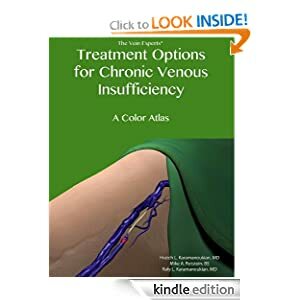 Dr. Raffy Karamanoukian and Dr. Hratch Karamanoukian have authored 6 books about venous disease. The books are available on Amazon Kindle and Nook books for download.